All the wonders of dream await - and all the terrors of nightmare, too. 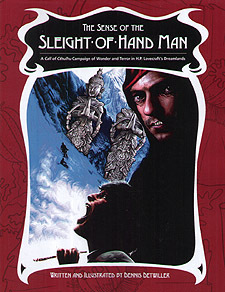 The Sense of the Sleight-of-Hand Man is a full-length Call of Cthulhu campaign of adventure, cosmic mystery, and deepest fear set in the Dreamlands of HP Lovecraft. The player characters - the Dreamers - explore the breadth of the otherworldly Dreamlands seeking a way back to the lives that they left behind. But can they survive the countless dangers of a world of dream - and the strange enmity of Nyarlathotep, the messenger and soul of the Outer Gods, when they fall under his capricious gaze!